Since their introduction at the 2015 winter NAMM show the Ascension Series drivers have been the subject of much praise and attention from professional guitarists, boutique amp manufacturers and reviewers. 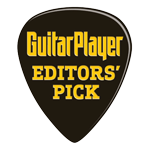 GuitarPlayer Magazine have now added to that praise, bestowing both the Ascension F70 and A60 with coveted Editor's pick awards in their March 2016 edition, a fantastic achievement! "The Ascension A60 delivered on its promise big time. Its immediacy and smoothly granular detail declared it a clear sibling to the F70, and it gushed with the tactile compression and juicy richness that so many players love in a good alnico driver, yet without ever giving over to mushiness." Hand made in England, we believe the Ascension Series brings something new, fresh and exciting to a guitar speaker market that has been static for too long with the usual choices. Our aim for Fane Acoustics is to shake this up giving guitar amp manufacturers and players something different and something special that really raises the tone and elevates the performance (hence the name Ascension!). "The Ascension F70 delivered a superbly rich and detailed response that made me feel the pickups’ coils were hard-wired to the speaker cone. It was fast, clear, and punchy—but impressively devoid of harshness—with a silky high end, moderately aggressive midrange, and a low end that was firm without being too boomy." Read the full review of the Fane Ascension A60 and F70 by Dave Hunter in the March issue of GuitarPlayer magazine along with other great guitar gear and content. A PDF copy of the review, courtesy of GuitarPlayer can be found below. Download a PDF copy of the GuitarPlayer review of the Ascension A60 and F70 here. The Ascension Series models are available now. Find retailers in our dealer network or buy direct on our website for shipping to the UK and Europe, visit FaneUSA.com for sales in the US.